At dbWatch we believe that DBAs should be able to manage their databases using a single solution. We understand your pains because we experience them, we work through our own bugs before going into beta-testing. Because we use our own software to monitor databases, we have learned firsthand the improvements needed. With Enterprise Manager 12, we have developed a package that gives DBAs a complete overview and platform to manage their workflow using one source. Seventeen years of building and programming database software has laid the foundation for this version. Enterprise Manager 12 increases functionality and allows trouble-free monitoring, maintenance, performance and planning. Four consoles offer you all the tools needed to smoothly manage databases. Within most consoles, the main screen gives an overview and tabs along the top screen allow you to dig deeper into details and help you stop possible problems more efficiently. All four consoles will be available in the web server view. Caption: Live Monitoring Console with the ‘stop light’. For the last three years, the “stoplight” has adorned the monitoring screen, measuring the pulse of all the data bases. A stoplight indicates: green - everything good; yellow - possible problems; red - alert. By keeping on top of the yellow notifications, DBAs can move from putting out fires to working directly on prevention and fine tuning. Data bases are similar to cars: They both run better when they are optimised. The Maintenance Group Console keeps an eye on the car’s oil levels, tire pressure and brake fluid. This console advises you when maintenance is needed. “We call it bullet-proof maintenance,” says Marek Jablonski, CTO. It monitors everything: re-indexing, statistics, changing routines, and adjustments. The Issues are highlighted in yellow and red, making them easy to identify. The following five tabs aid in the Maintenance Group Console: DBCC, Analyse statistics, Reorganise indexes, Rebuild indexes, and Cleanup msdb. This new solution came out of the demand for more information on maintenance routines, it allows DBAs to deploy routines and monitor how they are working. “Imagine if you are installing instances yourself – you have to manually deploy them, upgrade and collect information. Going back to the car metaphor: while the maintenance console monitors the fluid levels of a car, performance console keeps an eye on how the chauffer drives. Here, all instances are monitored and new instances can be found. The system’s level of use is recorded and instances can be found. 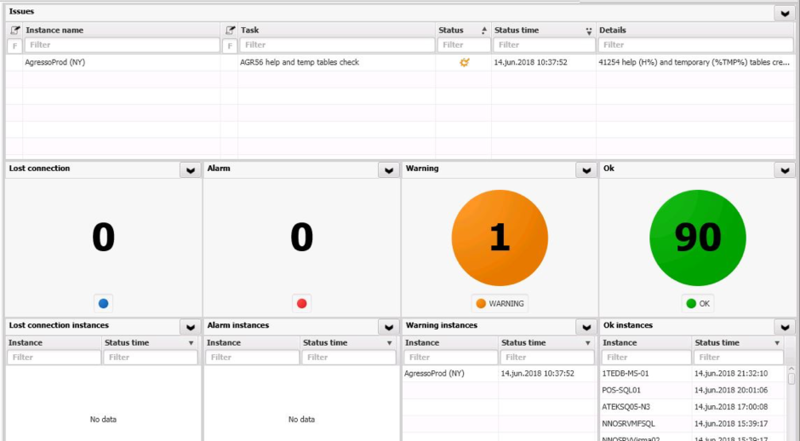 Alarms and warnings show the system performance and alert of potential problems. As its name suggests, the Capacity Console gives DBAs the information they need to plan ahead. Four tabs: Disk, CPU, Memory, and Data Cache; give DBAs optimal capacity measures. Marek explains, “Many DBAs don’t have a system to track exactly what they have done or how well their systems have been working.” By knowing what has worked well in the past, DBAs can better plan the future. The Capacity Console also gives DBAs important information they need to plan with a client, for example, knowing how much disk space is needed. This console covers a wide range of activities – tracking resources, growth rate, and the size of the environment. Additionally, it shows how the maintenance routes are being followed and finds patterns. Knowing what has happened in the past is vital for planning the future. Having this information on hand allows you to have strategic meetings with clients, allowing you to show them their past history and possibilities for the future. All of these consoles with their multiple views help streamline DBAs’ workflow. They aid at many different levels, from checking that everything is running smoothly, to maintenance tasks, performance analysis or checking capacity. Those currently using updated software already have access to some of these new features. dbWatch Enterprise Manager is released early 2019. Experience the difference of handling all your workflow from one program – find out first when we release: follow us on Twitter, LinkedIn or on our blog.